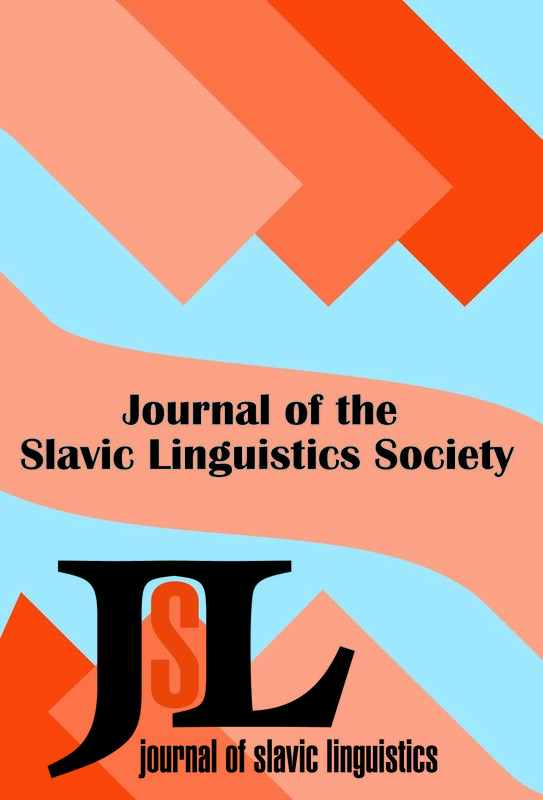 Abstract:This article provides a general overview of North American research in Slavic sociolinguistics from the beginnings of the field at the start of the 1960s up to the present day. The work of North American scholars published in a selection of journals, series, and special collections, as well as in monographs and dissertations, is reviewed to illustrate the research trends and the overall coverage of languages and sociolinguistic subfields as Slavic sociolinguistics developed and matured in a North American context. This study is intended to serve as a historical backdrop for the new research presented in this volume, and it closes with a brief overview of the studies in this collection and their contribution to the further development of the field. Abstract:The renarrated mood, sometimes called the “evidential”, is an innovation in Bulgarian grammar. Although it is primarily expressed with inherited forms, it includes one innovative form, a participle built on the imperfect stem of the verb. Prescriptive grammars of the socialist period stated that this participle could be used only in the meaning “renarrated”, and only without auxiliaries in the 3rd person. In the face of ample evidence that the participle is indeed used in a perfect-like compound form (i.e., with 3rd person auxiliaries), several grammarians proposed in the 1980s that this perfect-like form carried inferential meaning and should be termed the “conclusive mood”. This paper claims that the form in question is currently taking on a different, much broader meaning than either of these, and that this meaning, roughly defined as “generalized durative action in the past” is rapidly gaining acceptability among the younger generation. Abstract:This study examines the issue of language variation as characterizing the usage of an immigrant community in diaspora, specifically the Texas Czech community. It is demonstrated that the immigrants' language usage was rich and multifaceted, and that their language played a defining role in the maintenance and redefinition of ethnic and national identity. Specific features of language planning and language ideology of the Czechs and Moravians living in Texas are identified and discussed, chiefly as formulated in their press. Abstract:In this article I outline a theoretical and methodological framework for pursing a comprehensive study of the dominant issues and trends of Russian language culture from the Perestroika era through the present day. My chief claim is that the general shape, tone, and trajectory of a language culture will change over time and depend largely on the interdependence of three driving forces: language ideologies, economies, and technologies. To illustrate and substantiate this working hypothesis I examine both secondary theoretical sources and concrete case studies from the language culture of contemporary Russia (1987–2008). Abstract:This article investigates the interface between dialect, ethnic identity, and political developments in the rural communities of Bosnia-Herzegovina, where the cultural and linguistic differences among Croats, Serbs, and Muslims have been most pronounced. On the basis of a fresh reanalysis of linguistic data which have previously been cited in the literature to aggrandize the differences, it is argued that the claims of Bosnia's Serb, Croat and Bosniak communities for separate identities based on the criteria of language are dubious, and that the language differences are relatively minor. It is further suggested that only certain key ethnolinguistic markers have been used to construct the notion of separate linguistic identities there. Abstract:The present study analyzes electronic discussion forums in Ukrainian from a gender linguistic perspective. First, it tests hypotheses about the egalitarian vs. hierarchical nature of electronic communication. Second, it delineates a set of genderlect features found in electronic communication in Ukrainian. Finally, based on the discourse-oriented Speech Act Empathy Hierarchy (Kuno and Kaburaki 1975/1977, Kuno 1987), the analysis demonstrates that linguistic choices signal distinct discourse orientations of females and males in electronic communication space. Namely, in mixed-gender settings, on the continuum Speaker >< Addressee >< Others, females operate more locally: Speaker >< Addressee >(< Others). Males operate with the two opposite ends of the continuum: Speaker >(< Addressee >)< Others. The analysis emphasises that both genders have a range of speech strategies that are situational; however, in some settings, males and females negotiate meaning and perceive their relationship with the addressee/others differently. Abstract:In this article it is argued that the study of linguistic landscapes (public uses of written language) can benefit from viewing them as dynamic phenomena and examining them in a diachronic context. Based on the changes in the post-Soviet space since 1991, five processes are identified and examined in with regard to language change and language conflict. It is further argued that the study of linguistic landscape offers a useful tool for post-Soviet sociolinguistics and for Slavic sociolinguistics at large, and illustrations are provided of the insights afforded by such inquiry. Abstract:During fieldwork in the Slovene-minority area of Austrian Carinthia in 1998–2000, over two hundred informants were interviewed in six localities. The interviews were designed to elicit three types of data: (i) language use in social networks, (ii) subjective perceptions of “ethnolinguistic vitality”; and (iii) linguistic competence in Standard Slovene and Standard Austrian German. The three parameters were expected to correlate with each other. This article describes the questionnaire, scoring and analysis, and demonstrates that the three parameters of attitudes, social networks, and linguistic competence are indeed correlated with each other. Several specific conclusions are reported with regard to the factors which are involved in Slovene language-maintenance in Austria.